Men and women alike, whether you're into driving, fishing, baseball, golf, if you love this classic retro looks or if you're a Kurt Cobain nostalgic, a fancy motorcycle rider or a traditional clubmaster lover - all could use the benefits of the polarizing effect. POLARIZED HD VISION SUNGLASSES - We make our polarized sunglasses as comfortable as possible. Purchase from WSUK with confidence that the glasses you receive are fully CE certified and 100% UV400 protective. SUPERLIGHT, STYLISH: Lightweight design is ideal for motorcycle and cycling bicycle, driving, running, fishing, climbing, or other outdoor activities. Concise Design with Classic 80's Vintage Style make them look great. BEAUTIFUL PACKAGE - On the package,we put a soft case ,cleaning cloth and small screwdriver with both plain and cross head tips for many adjustments if needed in the future.The screwdriver and polarizing card can also help you know more about the sunglasses . 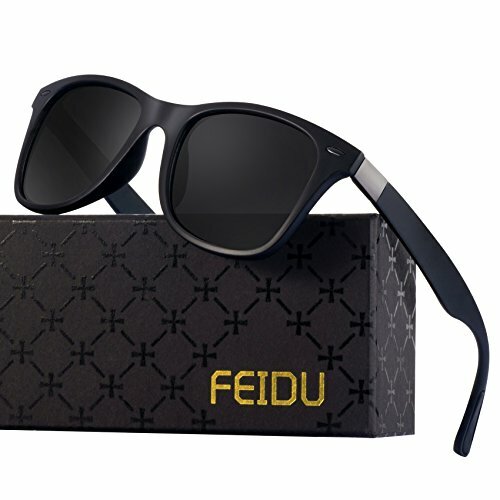 FEIDU GUARANTEE - 30-Day Money Back Guarantee. 24-hour customer services before purchase and after sales. You have no risk to try. And we will provide best customer service to you. If you have any questions about this product by FEIDU, contact us by completing and submitting the form below. If you are looking for a specif part number, please include it with your message.